NOTE: Pilots must be members of the Sky Surfing Club or one of the clubs the SSC has a Reciprocal Agreement with. Visitors and guests are not permitted. An excellent training and/or testing slope but a very gentle incline. Can suffer rotor in winds off to the west. 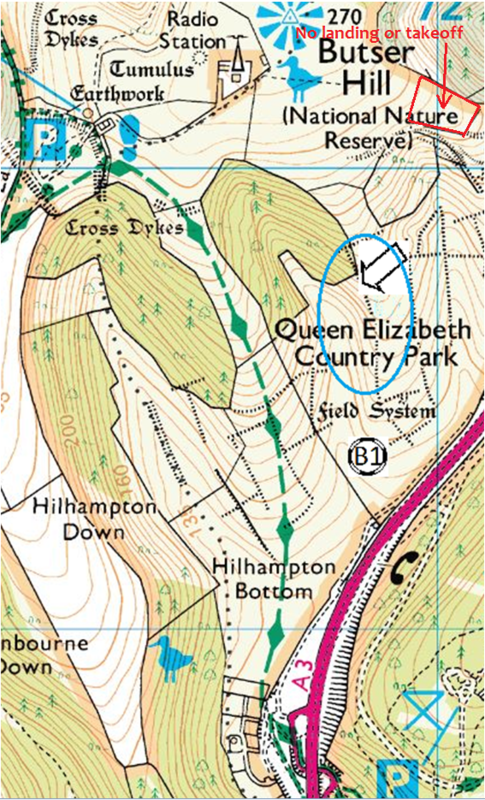 A useful alternative slope when the sea-breeze wind shift renders the West site slope unflyable. Slope is subject to scrub regeneration management and will therefore become less useful. Takeoff is right next to the corner of the trees. Soaring this slope is difficult but not impossible. ACCESS From the duty car park carry across the top of Butser, through the gate east of the radio mast and towards the A3 and over the stile in the top fence. Then follow the tree line down to the rigging area. RIGGING Back up slope from the Launch area. TAKE OFF Immediately below the wooded area. LANDING Down slope into the bowl or side landing onto the slope. HAZARDS Modern hang-gliders in fair conditions could glide beyond the normal bottom landing. RULES The whole slope and landing areas are within the Park and so there is no need to seek prior permission. One glider in the air at a time and hang-gliders must wait until the bottom landing area is clear. The only exception is the small fenced field at the back of the rear (northerly) bowl. See map above. CONSIDER This is an extremely limited site, probably only one at a time. Share the time and space. 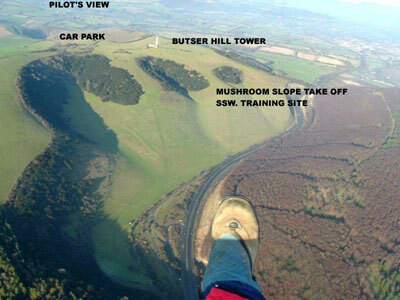 Aeromodellers use the slope above the wooded area and generally stay back, however the glider launch site is below their line of site and unintended conflict for air space can occur. Make contact so that they know you will be flying from lower down, keep a close watch for models and do not assume that you have been seen at launch. Only for the most determined pilots. 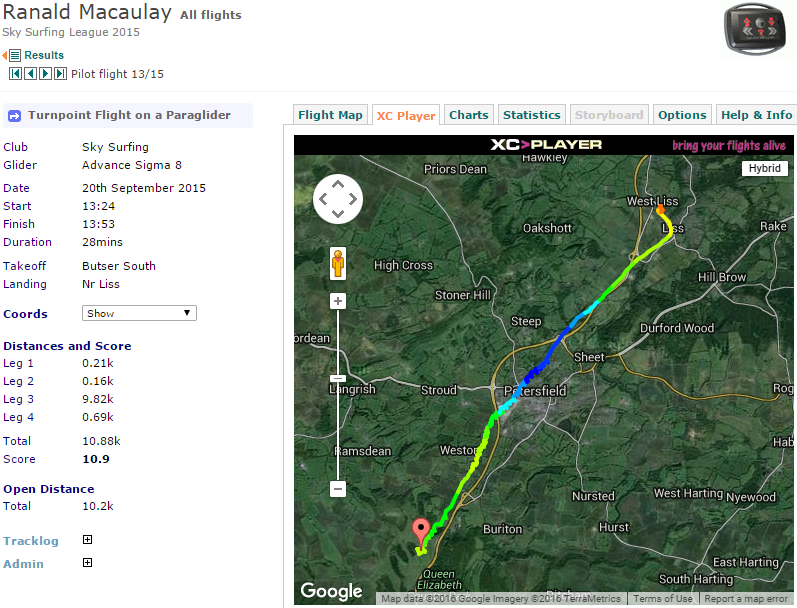 The thermals seem to develop quite well in the valley and they have to be hooked and followed quite aggressively. You have to leave the hill very low staying with the thermal. Once over the back the ground drops away and you have more searching time towards Petersfield. If we can get away from here in a southerly then it may be possible to clear airspace but it will be a real challenge. The wind will be trying to take you towards Farnham and Farnborough.